President Enrique Garcia de Castro welcomed the board members and described the challenges facing football in Europe in the upcoming year. In the past year, 2017, IFAF Europe Continental Association has succeeded very successfully in establishing a new association structure. A total of four major tournaments took place including the two qualifying tournaments and the finals tournament of the European Junior Championships and the Flag Football European Championships. In addition, the EUROBOWL was staged in Frankfurt am Main on front of nearly 8,000 spectators. The biggest challenges facing the IFAF Europe Continental Association in 2018 are the circumstances outside its control which have impacted on the staging of official competitions in Europe. In order to enable national teams to compete in official tournaments in 2018, the Spanish federation FEFA invites interested national associations to send teams to the "European Open" in Madrid this summer. As a result, all national associations that have scheduled national team activities in 2018 will have the opportunity to continue their programs. 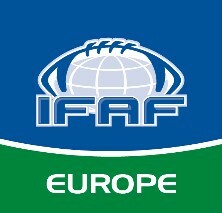 The Managing Committee of the IFAF Europe Continental Association has welcomed these plans and will support the project. Further details will be announced by FEFA shortly. Also planned for 2018 is an invitation tournament for Flag Football men's and women's national teams next October, also in Spain. Concerning the suite of club competitions, the fight for the EUROBOWL and the EFL Bowl takes place again this year. Overall, teams from seven nations are participating in these two International club competitions. In addition, there are also discussions concerning the revamping of the Atlantic Cup.